I just started breaking ground on my next ebook on travel photography. It got me thinking about some things I’ve learned, not only about photography, but about travel in general over the last several years. I’d like to share a few of those tips with you; these are practical and apply to everyone. They’ll not only make your travel experience better, but also make you a more efficient image maker. You’ve spent a lot of time planning and a bit of money getting to your destination, this is how you get the most out it. Spend More Time, Less Money. It’s easier than ever to go on amazing trips on a budget using sites like Airbnb.com and Booking.com. Make sure you’re spending enough time at your destination to soak it all in. Don’t rush around from one site to the next trying to pack in a lot on a tight schedule. I like to book enough time to really get to know a place; greater understanding of your destination enhances your experience and increases your chances of getting meaningful and unique images (instead of forgettable snap shots). The less money you spend on your day-to-day, the longer you can stay. Set a reasonable, yet lean, budget for your trip. Research the best local (and cheap) eateries like hell before you go. I (almost) always book Airbnbs with kitchens so that I can cook most of my meals instead of eating out two or three times a day. Shopping at grocery stores and markets like the locals will save you money, and give you a better understanding of what it’s like to live there. Make sure you’re centrally located too, so you don’t have to travel far and spend a lot money on transit. Paying a few bucks more per night in that downtown Airbnb might be cheaper than cabs, Ubers, and public transit from the big chain hotel on the edge of town. Click here for my post on How to Afford to Travel. For the love of everything you hold holy take less crap with you! I carry one 35L backpack with everything I need, including camera gear, for up to two weeks on the road. It doesn’t matter if I’m going to the Canadian Rockies just 3 hours from my home or if I’m flying to Europe and visiting multiple countries, I only take one bag. I know what you’re thinking…“That’s easy for you! You’re a young dude willing to rough it for good pictures!” My wife only takes one 34L backpack and her purse as a personal item. That’s it. She always looks good! We never check anything when flying. I find that minimalist packing relieves some of the stress of being in transit. Despite my love of visiting new places, I hate being in transit. With me, it’s the destination, not the journey. By packing one carry-on bag, I have less to keep up with and can get around airports and train stations more efficiently: no waiting for my checked luggage to be rechecked and risk missing a flight; no worrying that luggage will be lost or damaged (which happened to me in past before I knew better). 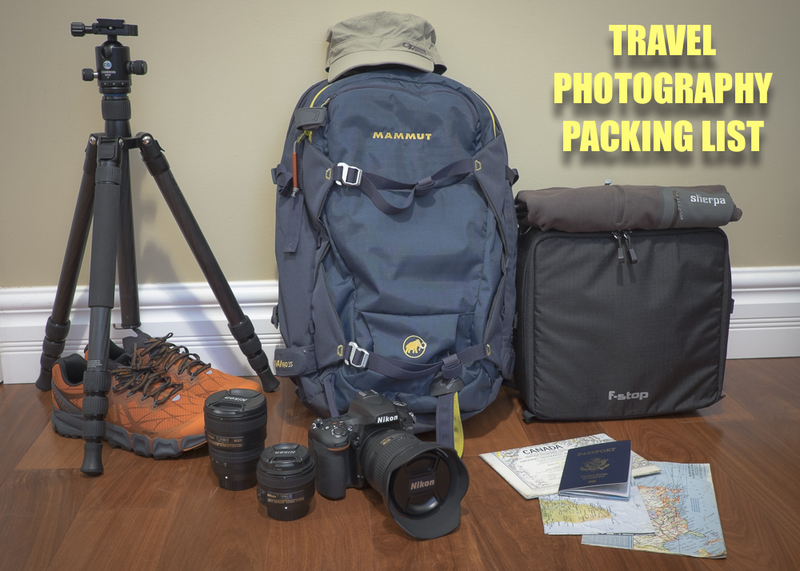 Click here to see my Travel Photographer’s Master Packing List. Sturdy, practical, and comfortable walking/hiking shoes are essential. Break them in before you go. Say you’re spending a week in Paris or Prague: those cobblestone streets are gonna tear your tootsies up if you’re not wearing the right footwear. Make sure to start walking in your main pair (especially if they’re new) several days to a couple weeks before your trip to make sure you break them in and to know in advance if they’re going to cause blisters. Blisters can ruin a trip. Pro Tip: Pack a little coconut oil to rub in between your toes each day. It’ll help relieve friction and help prevent blisters. I have a couple different foot issues I battle with about every time I travel. It’s frustrating. Being a photographer means I have to be mobile and need the ability to walk several miles a day. Gradually, I’m learning how to deal with these issues. You can save yourself a huge amount of woe and discomfort simply by picking the right shoes. I’d recommend a good hiking shoe brand; trail runners that are breathable are great for summer. Whatever you choose, make sure they’re not gonna hold you back. Accept function over fashion and save yourself some serious aches and pains. Not signed up for the Maps & Cameras email list? Subscribe by clicking here. This photograph was not an accident. I did not coincidentally happen upon this beautiful oak just as the sun was about to set on the horizon. Happy accidents are very rare in photography. This image was the result of planning, scouting, and timing. I’m afraid that most people have this idea that photographers walk about aimlessly with their expensive gear and picture opportunities just jump out at them. Then the camera does all the work, right? Nice gear equals nice pics? Not at all. I can’t stress that point enough. I was recovering from my recent surgery down on the North/South Carolina border near the coast over the holidays and getting very tired of sitting around. I had my camera gear in my backpack and decided to take a drive early one morning and arrived just before sunrise at Sunset Beach, North Carolina. It was surprisingly chilly weather for the low country, but it was great to be out doing my thing again (see images from this outing in the previous post). After my time on the beach, I drove over the border to Vereen Gardens in Little River, South Carolina. I’d been there before and remembered all the old oaks that hang over the marsh. I remembered the moss swaying from the branches. 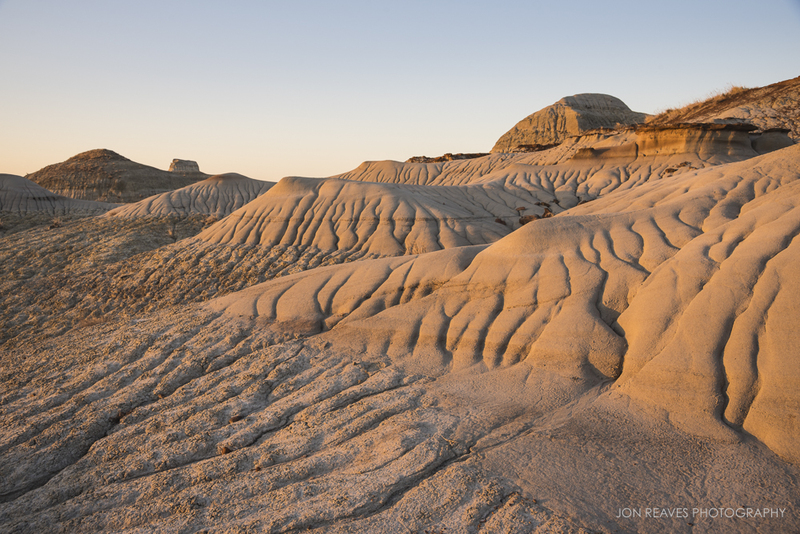 It seemed like it would be a great area for landscape photographs. Unfortunately, I’d spent so much time on the beach, the sun was too high for the image I imagined. I wanted the trees to be backlit and the moss to have nice rim lighting. I decided to watch the weather forecasts and return one evening when the sun would set behind this particularly interesting tree. On a clear evening I drove back over to Vereen Gardens with a particular shot in mind. I walked the wooded trails through the marshes to the old oak that I found most interesting. I knew exactly where the sun would rest briefly on the horizon before slipping behind it. There would be only a couple minutes to compose the shot. In order to get a perfect “sun star” I had to wait until the sun was just touching the horizon, then I had to compose the frame (with my tripod in several inches of black mud) so that the light poked through the branches in an aesthetically pleasing spot. I used a narrow aperture of f16 to help give the rays of sunlight more definition. Despite the high contrast in this scene (the extreme brightness and extremely dark shadows), I ended up not having to use exposure bracketing. I bracketed several exposures anyway, but the dead-centre exposure was balanced enough that there was plenty of dynamic range to pull out detail in the highlights and shadows. The sun dipped behind the tree-line, signalling my time was up. I was pleased with the results when I was able to look at the image on my big screen back in Edmonton. This image, for me, captures the feel of an evening on the Carolina coast. Warm light, Spanish moss, salty marshes, and huge live oaks are characteristic of the region. I am happy I was able to make an image that seems wild and untouched in an area so densely developed and over-overpopulated. It’s the natural South in a single frame. I like to travel light. Not "ultra-light" necessarily- I'm a photographer, so the gear required to do a job takes precedence over everything else I carry. That stuff adds a bit of weight. I do manage, however, to fit everything I need for most travel photography situations into a single 35 litre backpack (usually weighing less than 30 lbs). I don't check luggage. That means all the camera gear, clothing, and everything else has to fit into one backpack that fits in any overhead compartment. It's taken years to whittle things down and develop a system that provides me with everything I need and nothing extraneous. One pack means I don't have to waste extra funds paying to check bags and risk missing flights during layovers waiting for my luggage to be rechecked (never check your camera gear!). Below is my "master packing list." Everything listed here fits into (or onto) a 35L Mammut Nirvana Pro backpack. This system works great for both city travel and nature photography. The following assumes I am traveling to a destination by plane with weight restrictions. Pictured are a few of my travel photography essentials. The F-Stop Gear Medium Shallow ICU fits perfectly in my Mammut Nirvana Pro 35 backpack with just enough room left over for the necessary photo accessories and clothing for 1 - 2 weeks. The Cameron CF700 tripod with BH30 head is a new addition that I may review later. It straps securly to the outside of my backpack. Why not use a traditional camera backpack? After my most recent Lowepro bag finally kicked the dust, I decided to look for better options for not only storing camera gear, but everything else I needed for travel as well. Camera bag manufacturers just don't make comfortable bags for hiking long distances either, so I started looking into alpine pack companies like Mammut who make rugged packs with a fully-opening back just like traditional camera packs. The Nirvana Pro 35 zips open on the back to fully reveal the main compartment's contents just like F-Stop or Lowepro packs. Using the F-Stop ICU, I can have quick and easy access to my gear while the backpack lies flat on the ground. It works just like F-Stop Gear's system, but with a much cheaper backpack. For us Canadians, F-Stop bags are just too pricey once you factor in import fees and taxes. My Mammut bag, which is very well designed and comfortable, was only $120 CDN at my local outdoor gear shop (and about $150 for the F-Stop Medium ICU on Amazon). After several uses on international trips, wildlife excursions, and landscape shoots, I can confidently say this is the best/most versitile camera backpack I've ever had. * The highlighted items are affiliate links. When you click on a link and make a purchase, a small percentage of that sale goes to Maps & Cameras at no extra cost to you. If the product listed is no longer available, the link goes to the store I purchased it from, or to a similar item. This blog has no sponsors; however, all the items listed here are products I use and trust. As always, shop around for the best price.